This time of year I’m usually gifted with large bags of rhubarb by assorted friends and family. I love the stuff but sometimes feel like I’m running out of things to do with it. Not so. 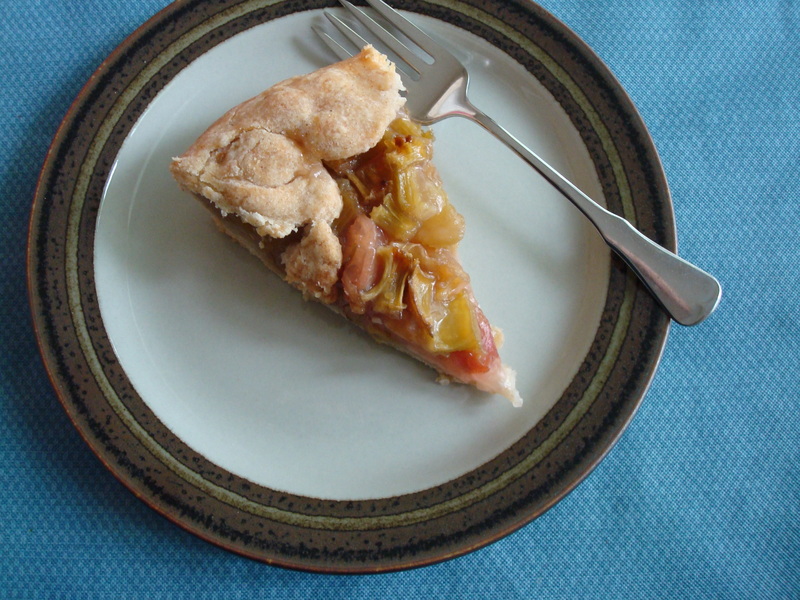 Though I’ve made several different kinds of rhubarb pie seen here and here and here, I still managed to find another rhubarb pie recipe that intrigued me. 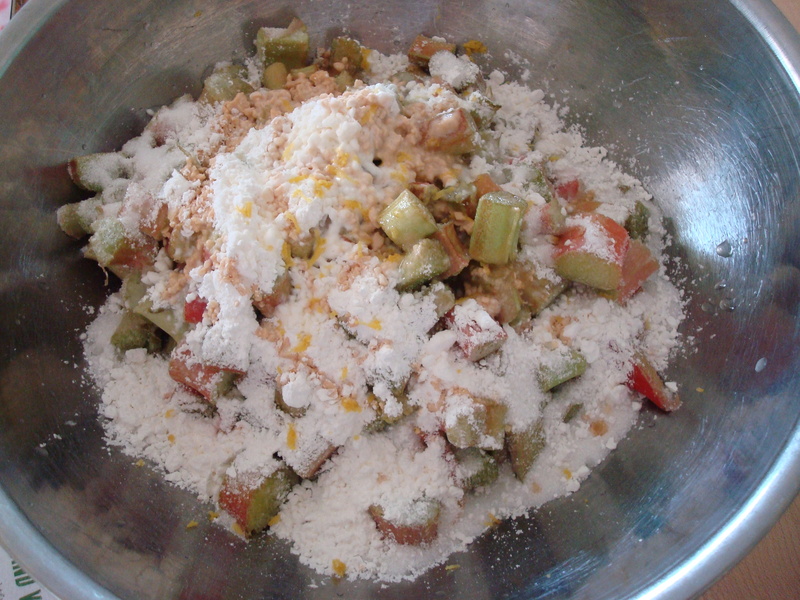 Lemon zest and juice and vanilla extract along with a bit of freshly grated nutmeg get added to the otherwise typical rhubarb filling. Genius! So simple, but so good. Next time I may actually add a little fresh vanilla bean along with the extract just to deepen the vanilla flavor. I had big plan for doing a fancy lattice top to this pie but was short on time so did what my mom calls a “flopover” pie. You simply fold the edges of the crust over the top of the filling. I’ve brought this style of pie to dinner parties before and people are always impressed and refer to it as a galette, which sounds much nicer than flopover. Those French and their fancy words. 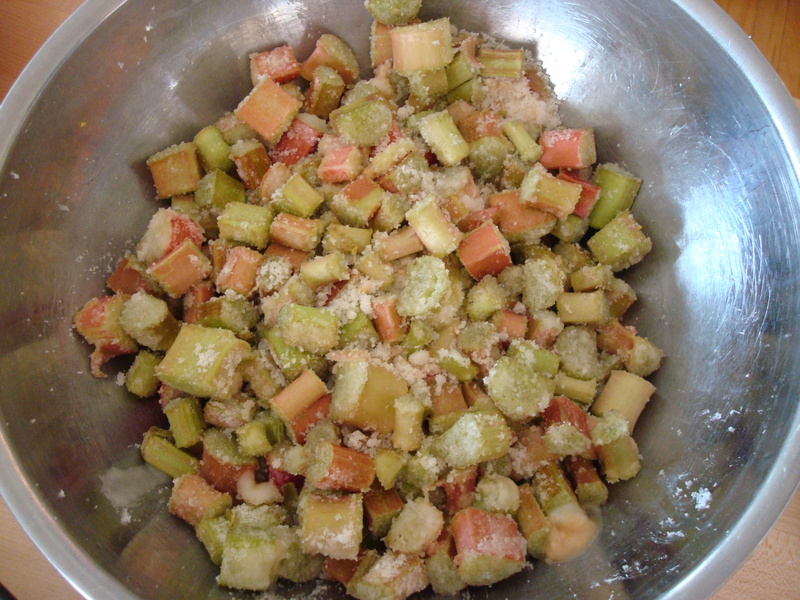 Place the chopped rhubarb, sugar, arrowroot or cornstarch, lemon zest and juice, vanilla extract, and nutmeg in a medium-size bowl. Stir together with a large spoon until well combined. 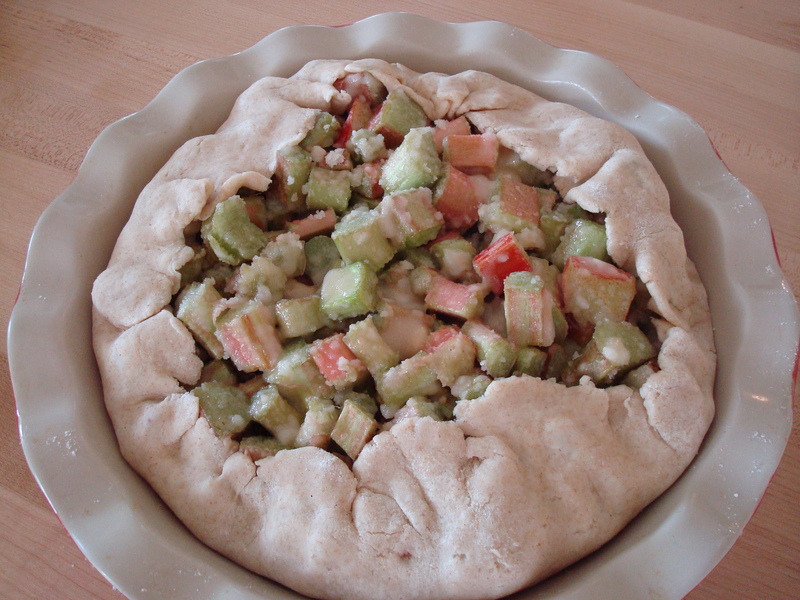 Pour the rhubarb filling into the prepared crust (see below). Fold crust over the top of the pie. Cover crust with aluminum foil to prevent it from browning too quickly. Remove foil for last 15 minutes of baking. Bake for about an hour, until the crust is golden and juices are bubbling in the center of the pie. Roll pastry on lightly floured surface, using floured rolling pin, into circle 3 inches larger than upside-down pie plate. Fold pastry into fourths and place in pie plate; or roll pastry loosely around rolling pin and transfer to pie plate. Unfold or unroll pastry and ease into plate, pressing firmly against bottom and side and being careful not to stretch pastry, which will cause it to shrink when baked.